Basic apparatus for providing contact, power supply and support to a germanium crystal on a circuit board (U8487010, U8487020 and U8487030) in experiments on the Hall effect or on conductivity. Includes an integrated, adjustable constant current source to provide the current through the sample, a measuring amplifier with offset compensation for Hall voltages and heating to raise the crystal to as high as 170Â°C, also featuring temperature regulation and a switchable display showing Hall voltage, sample current, sample voltage or temperature. 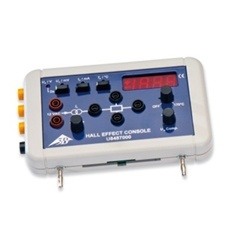 Hall voltage and sample voltage can be tapped directly from the front panel. In addition three equivalent voltage outputs for Hall voltage, sample current and sample temperature can be measured from the side. Includes an attachment for assembling the apparatus on the U-shaped core (U8497215) of a transformer assembly kit and 2 connecting leads with 8-pin mini DIN plugs. Universal power supply with digital current and voltage display. Extra low-voltage power supply with overload protection contained in plastic housing. Output voltage has four switchable stages.